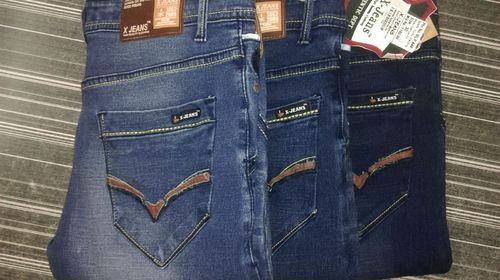 We are manufacturing & supplying a wide range in Readymade X-Jeans. Our brand is truely well known for its quality. With the support of our clints, we are capable to provides a good range of Readymade Garments. Our vendors make certain that the range is designed as per the international market trends. We are offering our clints a superb range in mens & ladies Jeans. Established in the year 1989 at Surat(Gujarat, India), we, 'Radiant Synthetics Private Limited' are believing in always something new in textile for which our company is known for in the market. Our product range also includes Elastic Tapes,Twill Tape, Braided Elastic Round Cords, Polyester Tapes, Flat Braided Elastic, Woven Elastic, Knitted Elastic, Personalised Ribbon, Gross Grain Ribbon, Weaving Yarn, Dyed Yarn, Nylon Yarn, Velvet Fabrics. The offered range of products are precisely engineered and manufactured utilizing high graded raw material and globally accepted manufacturing techniques under the guidance of our quality controllers in compliance with international quality standards. These elastic materials are highly appreciated among clients due to their reliability, hassle-free functioning, high performance and longer service life. In addition to this, we offer these tapes and cords in various specifications to cater the diversified requirements of industries at industry competent prices.